Barack Obama's campaign may be over, but internet activity around him continues. The latest development is Super Obama World! 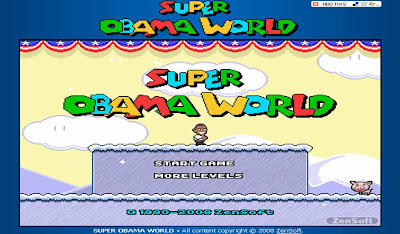 (http://superobamaworld.com) Created by ZenSoft and based on the classic Mario game, Super Obama World is a free online game that allows players to steer Obama through various Alaska themed levels collecting US flags instead of coins. Super Obama World also has various tongue in cheek references to the campaign, with players having to avoid John McCain and Sarah Palin, whilst Saks 5th Avenue and pitbulls in lipstick also feature. 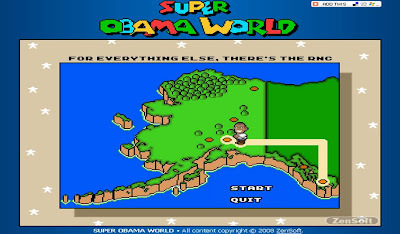 Super Obama World - avoiding Sarah Palin! The campaign may be over and there are some big issues that need to be dealt with, but Barack Obama's victory is still inspiring online developers to create Obama related content and Super Obama World is a good example of how this is continuing. Barack O'Bama - Irish claim new President as one of their own!